Opinions, informed and otherwise. And occasionally, haiku. According to the LA Times, SpaceX has internally announced plans to lay off 10% of its workforce to become a "leaner company." Wow. This is a messed up situation. 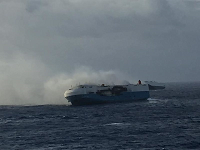 Car carrier ship in the pacific ocean burning and abandoned. Two crew confirmed dead and two missing. This is the very beginning of the McKenzie Report.